Versatile HB LeVeon Bell (#26) is a primary reason the Steelers could be an extremely dangerous draw in the postseason. In terms of being predictive our Week 13 Report was 11-5 (.686) in Week 14. That brings the BES to a 44-17 (.721) combined record in the last four weeks. With three weeks remaining in the season, we are curious to see if this +70% accuracy holds until January and what, if any, accuracy it has predicting postseason victors. The Patriots (11-2) top our rankings this week after both the Raiders (10-3) and Cowboys (10-3) suffered losses to divisional rivals. Minus superstar tight end Rob Gronkowski, the Patriots were impressive against a stout Ravens (7-6) defense in a 30-23 win Monday night. With a 3.24 BES Overall score, they now hold a commanding .10 point lead on the rest of the field. Their final three games features two on the road, including the season finale at the Dolphins (8-5). 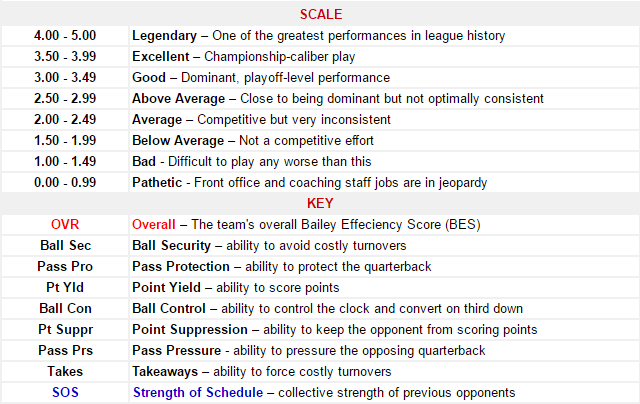 The Chiefs (10-3) have defined themselves as a team that protects the football while capitalizing on opponent turnovers. 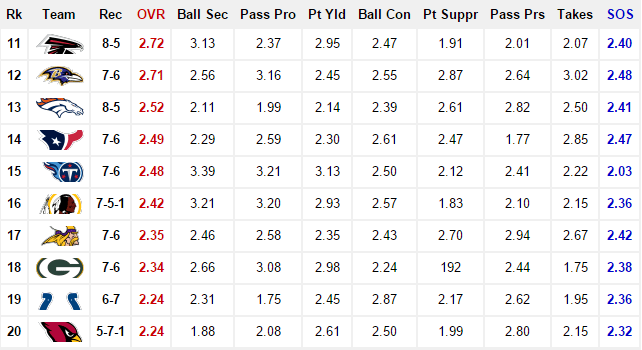 Their Ball Security score of 2.96 and Takeaways score of 2.80 summarize what has fueled their current first-place hold on the AFC West. 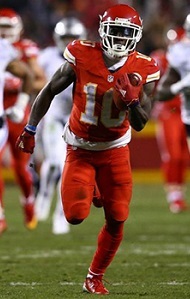 Meanwhile, electric Chiefs receiver Tyreek Hill has established himself as a premiere weapon on offense and special teams. As a rookie, Hill owns an impressive nine total touchdowns including a team-leading six as a receiver. 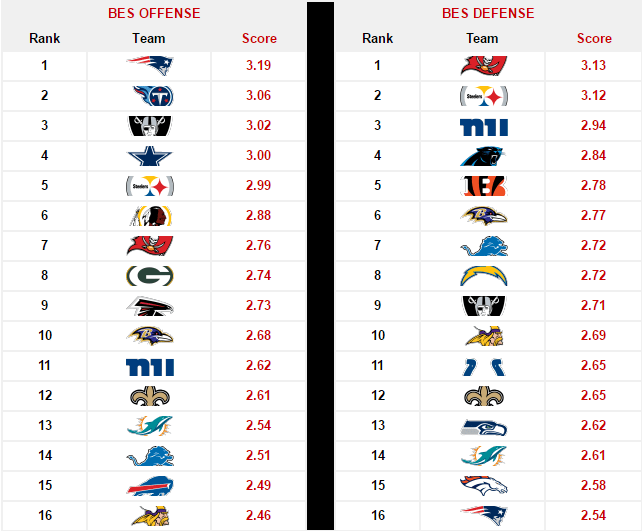 We’re sure it raised a few eyebrows when the Buccaneers (8-5) topped our Week 13 rankings in BES Defense with a score of 3.03. However, our data was supported by them holding an explosive Saints (5-8) offense to zero touchdowns and three field goals. As a result, the unit now owns a 3.13 in BES Defense and faces another challenge in Week 15 on the road against the Cowboys. Another defense playing extremely well is that of the Steelers (8-5) who have seized control of the AFC North. The unit is No. 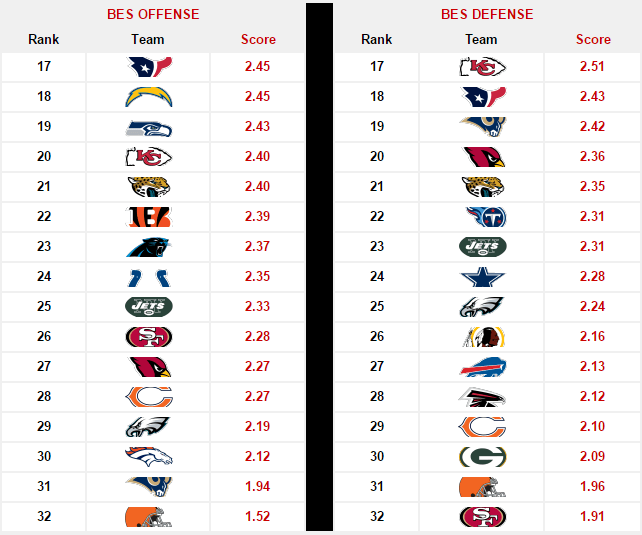 2 in BES Defense this week after allowing just 12.5 points per game over their last four contests. Fortifying that stat is a Point Suppression score of 3.27 that paces the other 31 teams in this week’s report. The Steelers monstrous jump from No. 12 in our Week 13 report to No. 3 this week is indicative of the tsunami-like swell of momentum they are riding into the postseason. Their SOS of 2.61 is by far the highest among the top-10, adding credence to the notion of them being an exceptionally dangerous draw in the playoffs. They need to open the play book up some an focus on Tennessee one game at a time. This team is good just have to play all 4 quarters (offense). I could care leas what these rankings say. Let them keep us under the radar. Lets just keep winning and hitting teams hard. Keep the play book open and lets go #chiefskingdom we have a team that is family and has everyones back in that locker room. Its just awesome to see. So we have more takeaways than anyone and we’re not ranked highest in that category? 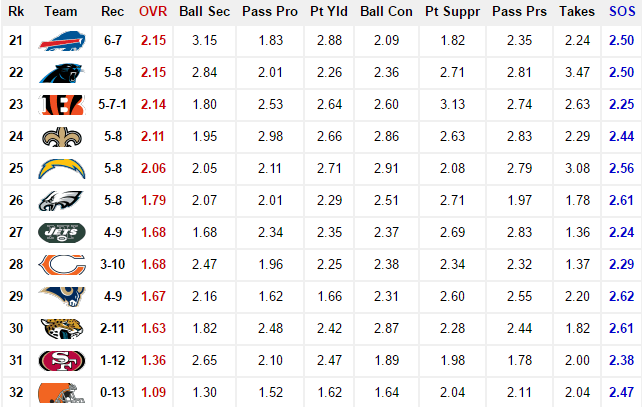 In the NFL league standings the Chiefs are #3 on win percentage and tie-breakers. 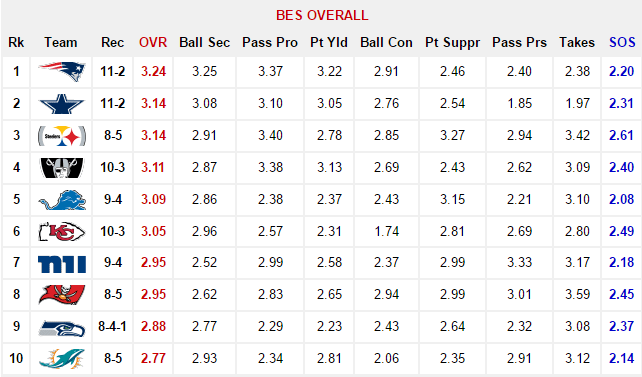 The BES incorporates the standings but also measures a team’s on-field performance over the last 8-10 games. Only five other teams are hotter than the Chiefs according to the BES.